I had already read ‘The Baby Trail‘ and ‘Perfect Match‘ by Sinead Moriarty where she tells of James and Emma Hamilton’s quest to start a family. In those two books they go through unsuccessful fertility treatment and then the lengthy process of trying to adopt a child. In this third book – From Here to Maternity – we find them with their newly adopted son Yuri, and also discover that now she has given up trying, Emma is actually pregnant! Having enjoyed the other two books very much, I was very keen to read this one although I also had a worrying niggle that, like many sequels, it would not live up to my expectations. In fact could this be one book too many about this likeable couple? I have to admit that I did not get into this book quite as easily as the other two, but by the end of it I realised that I had thoroughly enjoyed it – as much as the other two! In ‘From Here to Maternity‘, Emma and James go to Russia to bring home their son and from then on we read about how they cope with the early days of parenthood. Emma does not particularly find it easy especially with being pregnant as well. We also meet all of the other characters from the earlier books – Emma’s hapless sister Babs, her brother Sean and his fiancée Shadee, their friends Lucy and Donal who have just got married themselves. There is a story around each of these characters too and it’s all a bit of a juggling act for Emma as she tries to keep up with everyone else’s lives as well as her own. All of these different stories weave together extremely well making for a very enjoyable read. I find all of Sinead Moriarty’s characters interesting and well rounded. I love reading about how they interact with each other and there are some very funny conversation between Emma and her mum (who has very strange ideas about lots of things. Emma often seems to find herself being the intermediary especially where Sean’s plans for his wedding are concerned. Many of the characters such as Mum, Babs and Donal bring a great deal of humour to the story. ‘From Here to Maternity‘ is a great story and I’m sure many women will identify with Emma and the things she goes through in initial motherhood – sleep deprivation, always looking a mess and being very unsure of herself to mention just a few things. Many of these things are dealt with few humour although it does not make light of them either. I found it a lovely book to read as it was poignant and funny in equal measures. 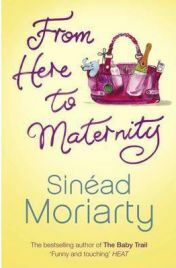 Even though ‘From Here to Maternity‘ is the third book in a series you could easily read it without having read the others first. This is particularly helped by the fact that Sinead Moriarty keeps explaining much of what has happened before. I have to admit that, because I had read the others, I found this slightly annoying and I think that is why I found it harder to get into. I did not need all the background as I already knew all the characters, but I can understand why she felt the need to do it. This did get better after the first few chapters though which is when I started really enjoying it. No Comments on "From Here to Maternity"